Anxious About Antibiotics? Read This. February. 20, 2006 03:01. by Jin-Han	Lee likeday@donga.com. In order to prevent the misuse of antibiotics, the government recently revealed a list of hospitals and clinics that prescribe high amounts of antibiotics. The most commonly prescribed antibiotics, "-mycins," have played a great role in prolonging human life expectancies by eliminating germs. However, overuse of antibiotics will cause germs to gain resistance, and a vicious cycle where stronger antibiotics are used to kill stronger germs is being repeated. But we cannot afford to renounce antibiotics, either. Lets look at some common illnesses that require antibiotics and find out how to correctly take them. About 90 percent of enteritis cases, otherwise known as viral or bacterial intestinal infections, in children are caused by viruses like rotaviruses and adenoviruses. These viral intestinal infections cause problems in the upper digestive organs, such as the small intestine and the stomach, and often lead to vomiting, diarrhea, and severe stomachaches. On the other hand, bacterial infections are caused by bacteria in the intestines, leading to liquid or hema feces, and this is when antibiotics are prescribed. In addition, epidemic keratoconjunctivitis, or pink eye-type ocular infections that cause neck pain, bloody eyes, and fever do not call for antibiotics in principle. That is because the condition is naturally cured in about one to two weeks. Ocular medicine, pain relievers, and antichloristic medicines are used to reduce inflammation and pain, instead. Urinary infections, such as bladder and urethra infections are commonly caused by germs rather than viruses. Hence, antibiotics are more effective in such cases than other diseases. Even common colds, if they involve secondary bacterial infections, call for the prescription of antibiotics. The most common illnesses that accompany colds are laryngitis, bronchitis, pneumonia, tympanitis, paranasal sinusitis, and tonsillitis. In particular, bacterial paranasal sinusitis causes high fever and yellowish nasal mucus. Symptoms of bacterial laryngitis include fever and sore throat, but in the initial stages, it is often mistaken for a common cold. However, when there is no runny nose or coughing, and only high fever and a sore throat, chances are that there will be a white mucus crust inside the throat. Common cold patients that are highly susceptible to other bacterial infections, such as pneumonia and sinusitis, are also prescribed antibiotics as precautionary measures. That is the reason why 30 to 40 percent of cold patients are prescribed antibiotics. Varicella, or chicken pox, is also a viral disease that doesnt need antibiotics. The blisters on the skin caused by it can become infected, however. Antibiotics are used to prevent that from happening. On the other hand, eye sty cases are mostly bacterial infections, calling for ocular antibiotic ointments and ingested antibiotics. 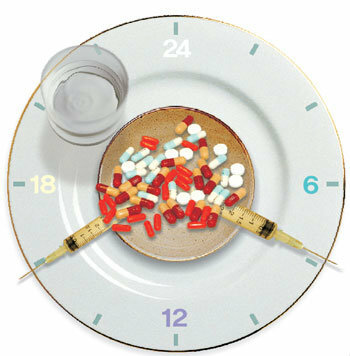 Time is very important when taking antibiotics. One should take antibiotics at regularly timed intervals. For example, if a patient is taking antibiotics three times a day, it is better to take them at eight-hour intervals rather than after meals. If the timing of antibiotic ingestion is irregular, the antibiotic-levels in the blood will fall below an effective level, and the dying germs will once again attack the body. That is why it is critical to take them regularly, even though it can be bothersome. If the patient thinks that his or her condition has improved and stops taking antibiotics, then the illness is likely to recur. If the germs grow tolerant to the antibiotic, then treatments will have to start using another antibiotic, which will result in more antibiotics being taken. If prescribed drugs dont seem to be curing a problem, going to other doctors and getting more antibiotic prescriptions is not the answer. It is very likely to increase the germ-tolerance of the antibiotics being taken. The strengths and types of antibiotics are all different, and are used at different stages of illnesses. When these stages are ignored, germs grow more resistant. If one changes doctors, one should tell his or her new doctor about the antibiotics that were previously prescribed. A side effect of taking excessive doses of antibiotics is damage to the liver and kidneys. If yellow eyes or a reduction in the amount of urine develop while taking antibiotics, consider the possibility of antibiotic side effects. Diarrhea, fatigue, nausea, vomiting, and rashes are other side effects of antibiotics. Most of them are temporary and will stop after an antibiotic treatment ends.